As you guys know, I'm a huge fan of Dinair (if you don't know, you can read my full review here). Not only does airbrushing make your skin look naturally flawless, but it can also create perfect, professional eye makeup in seconds. 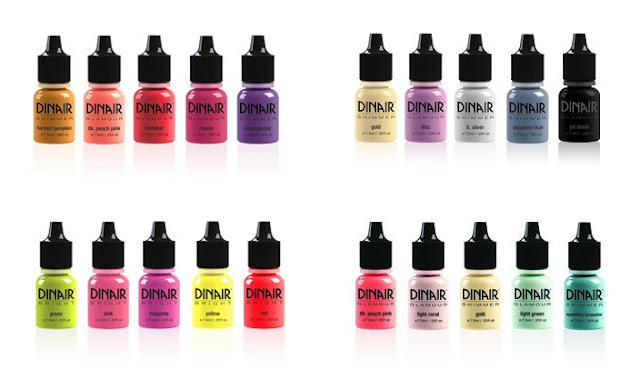 To make things even easier, Dinair now offers color collection sets -- think of these as beautifully compiled eye makeup palettes in bottle form. 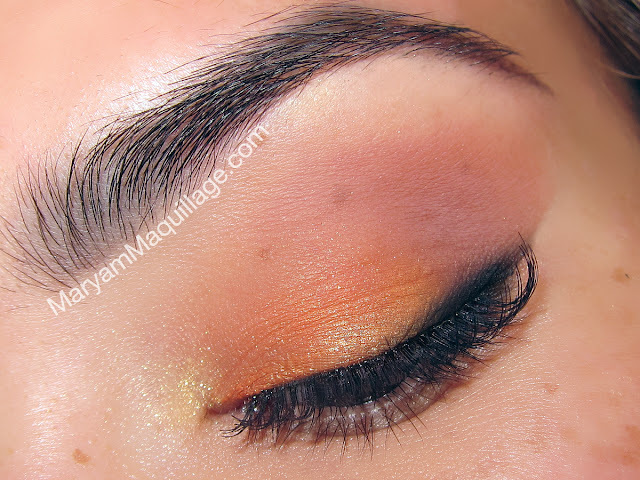 I am totally obsessed with the color combos and today's look is the result of my obsession. Brights Collection -- so fun & vibrant!! Malibu Collection -- inspired by Malibu, enough said! Using airbrush makeup cuts the application process in half. This part speaks for itself as it is extremely valuable for everyone on the go: students, busy moms & business women. Airbrushing eliminates the need for blending. 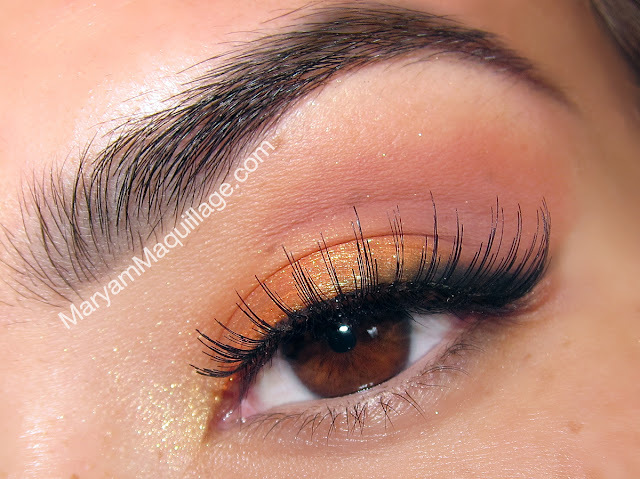 With regular eye shadows, blending is the most difficult and time consuming part of makeup application. With airbrushing, there is just as much control, but you don't need to be a makeup artist to create pro results. Color can be released with precision or applied softly to look diffused at the edges, and these techniques simply depend on your distance. Once you get the hang of using an airbrush, this part becomes so easy, you can practically do it blindly. Color payoff is excellent: what you see in the bottle is exactly what you get on the skin. Creating a flush of color or a full-on opaque finish is determined by layers, so the creative possibilities are endless. Dinair Airbrush makeup dries on contact and does not require any primers, setting sprays or other helpers to keep your makeup lasting all day and all night. Even with my oily lids, this stuff doesn't slide, crease or smudge anywhere. I've even worn Dinair eye makeup to a rave on a hot, humid summer day and by the end of the night, I looked as fresh as I did when I first applied it! No joke! Airbrushing is a lot more hygienic than using brushes and sponges; furthermore, it eliminates the need for a lot of tools. With one simple tool, you can create a full face look -- from eyebrows to blush to lip color -- Dinair has you covered! 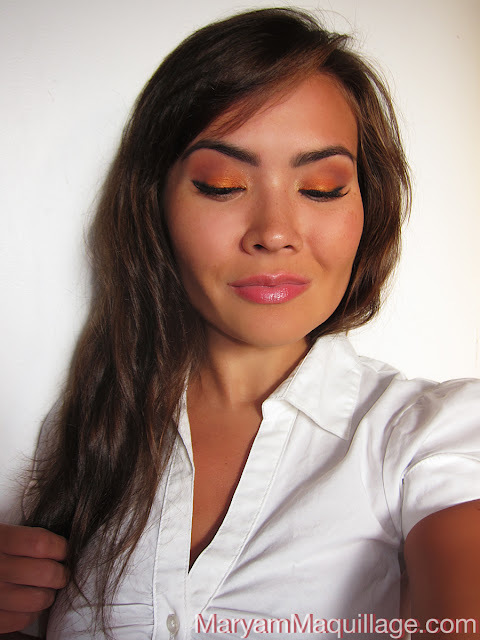 This "Summer into Fall" transitional makeup look is great for school and/or work and can be completed within 15 minutes using the Dinair Airbrush Makeup Kit and any of the Color Collections. Show off your sun-kissed summer skin with warm golden neutrals and keep it fall appropriate and professional with peach lips and sharp brows. Stay tuned for my "End of Summer" Party look coming soon! I love this! I'd so like to try this dinair system, i just can't get myself to spend that money for it :D..This white blouse looks cute on you! Girl, you look stunning as always! Can't wait till you do my makeup again!!!!!! Cassie can't wait till you do hers either!!! thanks my love!! anytime you ladies want -- I'm your girl!!! oh you'd love it!! I can't even imagine the creations you'd come up with!!! really loved the look... gorgeous! thanks!! you'll be a mess the first time (I was due to nerves lol), but once you try it a few times, you'll be a pro!! I can't wait to see your look Nancy, I KNOW it will be so fabulous!!! 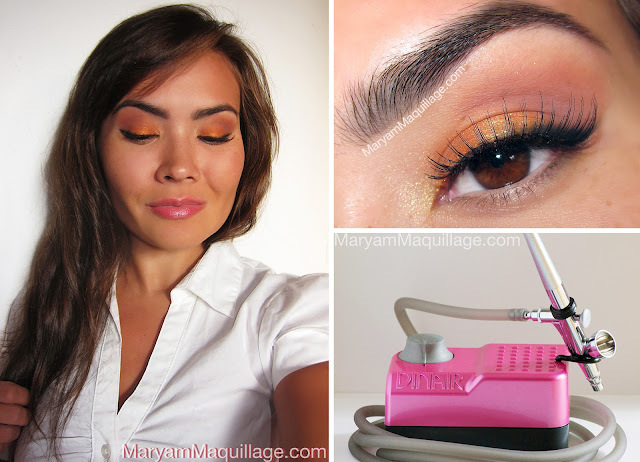 Wow, I've never tried air brush makeup but it looks so interesting. Your make up looks BEAUTIFUL, and thanks for the tips. I'm definitely going to give this a shot! wow the eye makeup looks awesome .. didn't know that there was an airbrush thingy for eyes also ..
wow did you really apply this makeup using this airbrush? it looks so flawless and gorgeous! I agree that it does look professional and the colours are fab! Although I don't wear an awful lot of eye shadow so I couldn't see me purchasing it. thanks Samantha :)) I'm very happy to have the tan range to match my sunkissed summer skin!! this is beautiful I love it sooo pretty and simple and great for a day look!!! this look will be perfect for my daily basis. i never tried airbrush makeup but this sounds cool to use.. should try out! i just started using fake lashes.. i was inspired by your makeups and hopefully could post one of my look soon..
Super gorgeous honey, love it! I definitely share your affinity for the summer and melancholy at it's end, but TECHNICALLY summer isn't over until like, late September. Soooooo, I'm holding on to my denial for a while. Related to the makeup, I wish I EVER looked this good going back to school. My back to school looks were always so try-hard. I never managed to pull off something this effortlessly pretty, especially that had this much color in it. Then again, I also never had an at-home air brush machine. Lol. Beautiful color combo, one of my faves. Just wish I had the darker complexion to pull it off. The airbrushed makeup looks so smooth and evenly blended! I'm definitely celebrating the fact that I DON'T have to go back to school this year!! Yup, that's the best part about it. It smooths out lines and uneven skin surfaces / textures... Lol, I'm celebrating too!!! You are gorgeous & this look is amazing! Was it difficult to learn how to work with the airbrush using the CD & can you use your own liquid makeup in the machine? I'm thinking about investing for body painting. Gorgeous! Love the smoked liner effect! I want to get a dinair airbrush so bad but it is a little pricey for me! Airbrush makeup look very natural on you and I love it!